In part 2 of this Data Validation Series, I showed how using a named range when adding data validation to your fields allows for a cleaner worksheet. Listing the values you want to allow for a specific cell (field) on another sheet, then naming this range so that you can refer to it in the Data Validation window, I showed you, is more efficient and cleaner than listing them in the Data Validation window itself or separately in a list, but on the same sheet. But we can enhance this method even further. Using the named range, you might have discovered, makes adding an item to the list difficult. You either have to change the referenced range area each time you add an item or you have to make the original range large enough to include further inclusions. 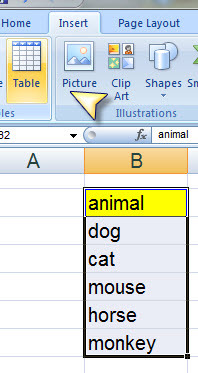 Unfortunately, creating a range with blank rows leaves spaces in your data validation list. That’s obviously not ideal or neat. Using named ranges is a very useful trick and can be applied in a lot of ways, including data validation. In part one of this Data Validation series, I showed you how simple it is to add validation to your spreadsheets, increasing the ease and accuracy of data entry. In that post, I showed two ways of limiting the allowed values for any particular cell. The most straightforward method involves entering the values directly into the source box. Alternatively, you can enter the allowed values in a column somewhere else on the spreadsheet and then refer to that range of cells in the validation window. The downside to this method is that you must list the values on the same spreadsheet as the field on which you are applying validation, adding unnecessary clutter. Of course you could hide the column or put the values well off of the visible screen (e.g. column ZZ or something like that), but you’d have to unhide the column or scroll over to the far right of the spreadsheet every time you wanted to update the list. That is obviously not ideal. Indirect Function: using named range as the source. It’s that simple. In part three of this series, I’ll show you another cool trick. 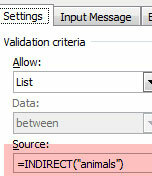 What if you wanted to restrict allowable values in a cell based on the value in another field? For example, let’s say you have a field for “State.” Depending upon the value in that cell, you then want to allow a finite list of cities to be selected. Again, with the use of named ranges and the Indirect function, this is a lot easier than you might think. Enter your email address to subscribe to bobbybluford.com and receive notifications of new posts by email.